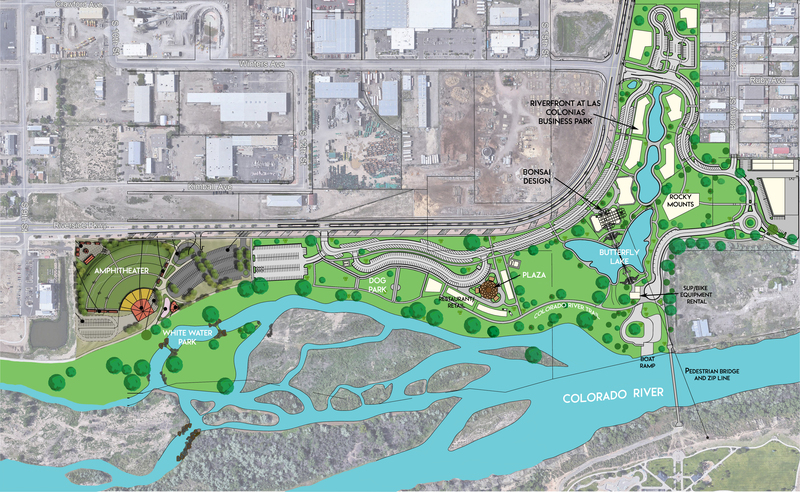 RIVERFRONT at las colonias PARK is a 140-acre mixed-use park in the City of Grand Junction. 15 acres are designated for a business park geared toward outdoor recreation and tech-related businesses. The development provides a truly unique opportunity for visionary businesses seeking an outdoor-centric setting. By integrating access to outdoor fun, a collaborative community, and high end fit and finish, the development seeks to honor and support a healthy community balanced between work, play and commerce. Currently underway, RIVERFRONT at las colonias PARK will incorporate this industry’s passion for the outdoors into the infrastructure itself. All buildings —both provided and those built-to-suit— will incorporate sustainable design practices from LEED, Green Globes, and like-minded industry leaders. The total office park will embrace the natural environment around it both visually and with an eye toward protecting our natural resources. Outdoor meeting zones will be scattered amongst the buildings, providing opportunities for executives to get outside and recharge or to share inspired time with their contemporaries. Recreational amenities will include an open space park, aerial adventure, bike trails, retail outlets and a river recreation zone. Shared conference rooms, large format training spaces and expandable warehouse sections will provide our partner businesses state-of-the-art resources at reduced costs to each individual company. Zoning: Riverfront at Las Colonias Park is a city park. The parcels available within the commercial business park are offered by the City of Grand Junction as a lease and offer multiple uses: offices, services, light-industrial and manufacturing and associated uses. The area between the dog park and the festival area is envisioned as restaurant and retail commercial space. Access: The business park is accessed from Riverside Parkway at both the east and the west ends of the park. Landscaping: All landscaping and irrigation will be done by the City of Grand Junction Parks & Recreation department. The area north of the Colorado River Trail will be a park-like setting with a grass festival area, three small lakes, trees and shrubs. The area south of the Colorado River Trail will be more natural and have a ‘open space’ feel. Topography: The site is mostly level with unobstructed views of the Colorado National Monument to the south and the Grand Mesa to the east. The park slopes down towards the Colorado River south of the Colorado River Trail. Flood Zone: Although located along the Colorado River, all but one of the pad sites are outside of the 100 year floodplain. All pad sites have been elevated above the floodplain. Soils: Similar to many areas in the Western United States, the geotechnical investigations completed to date recommend engineered foundations. Environmental: A Phase I was performed and there are no known environmental conditions. This was the site of a uranium mill in the late 1940’s and 1950’s. Department of Energy reclaimed the site in the early 1990’s prior to deeding the property to the City of Grand Junction. The City has since built the Riverside Parkway, numerous utility projects , the Amphitheater and now Las Colonias Park and has found no evidence of any environmental concerns. Parking: A total of 275 parking spots are located all around the park. Parking spots will be reserved during business hours for the commercial office park on lots where the tenant will not build out additional parking. Builders on Lots D and E are envisioned to develop their own parking. Separate parking totaling 144 spaces are available for the restaurant/retail/festival area of the park. Overflow parking is available to the west of the business park in the amphitheater parking lot totaling 340 spaces. Utilities: Each lot is shovel-ready with water, sewer, gas, electricity and provisions for fiber in place.